With Korean music having an increasingly high profile in Europe, a growing number of Korean artists are aiming to enter the European or US markets. There is another market, however, that is located close to the United States but is more liberal in terms of its visa requirements—that of Canada. Like other Western nations, Canada is known for holding a variety of annual festivals from the end of June through to September, with offerings ranging from comedy to jazz. According to the Canada Council for the Arts, which had representatives on hand at the World Music Expo(WOMEX), the country offers more than 60 festivals focusing on music alone, including the genres of folk, rhythm & blues, world music, the aforementioned jazz, and more. These festivals boast a strong network among themselves. With the fifth Mundial Montréal approaching—the country’s first world music market—it is increasingly clear that Canada has its door wide open for musical communication. Bearing this in mind, I recently sat with Kerry Clarke, the artistic director of the Calgary Folk Music Festival. Clarke had visited Seoul as a guest of the Journey to Korean Music program organized by the Seoul Art Market, an event that focuses on the exchange of world music experts. 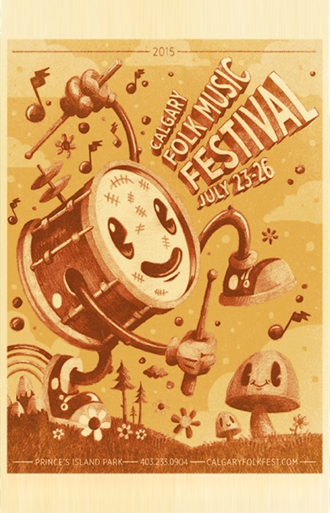 What is the Calgary Folk Music Festival? Q Lee Su-jin: What kind of festival is the Calgary Folk Music Festival? How did it get off the ground in Canada? Kerry Clarke: The history of Canadian folk festivals dates back 55 years, originated by a director named Estelle Klein. At the time, it revolved around western traditions and the lineups were full of singer-songwriters—mainly acoustic. The Winnipeg Folk Festival was launched 42 years ago, and then other cities like Vancouver, Calgary, and Edmonton joined in about 37 years ago. In those days the festivals were small and only two days long, and mostly consisted of western folk music. It gradually expanded to a four-day event, and events like the workshops became part of it. These days, the festival is attended by around 70 international artists. The focus is on western folk music and Celtic1), and branches out to bluegrass2), traditional music of the world, and modern music that developed over time, like African electronic. The events are held at Prince’s Island Park in the city center, which was chosen because of its accessibility to the community and—an element that, frankly, is necessary for the festival to be financially viable. Of course, the artists feel the same about the location as well. Each day of the festival attracts an average of 12,000 music lovers. Apart from the festival programs like the main stage performances and collaborations, there are sessions like the teaching workshops for the locals, which are run by local musicians or those who are touring Canada. About 200 locals partake in the event every year, learning how to play instruments, write songs, and plan performances in conjunction with venues. 2) A subgenre of country music that developed in the United States around the late 1940s. It usually featured high-pitched vocals accompanied by a fiddle, guitar, mandolin, bass, and five-stringed banjo, with either the banjo or guitar playing the lead. Q How is the festival operated, and how is it funded? Kerry Clarke: Canadian artists are mainly supported by the Canada Council of the Arts. Regional festivals like ours get partial government support from the Ministry of Canadian Heritage, and the remainder comes from both Calgary Arts Development, which functions as a local government agency, and from the lottery fund collected by Alberta Foundation for the Arts. The annual operating costs amount to about CAD 4 million, of which 20 percent comes from public funds while the remaining 80 percent comes from private donors and ticket sales, and from running the beer garden. Q. The event’s collaborative workshops3) are just as interesting as the lineup of artists at the festival. How did this idea come about? Kerry: We find that it is sometimes uncommon for certain artists to come in contact with each other, despite performing at the same festival. At one of our collaborating sessions, however, musicians stand on the same stage and showcase their music, taking turns talking about their songs and player. For instance, a musician might introduce their music by saying, “I was inspired by my mother,” and the next musician will play another song inspired by their mother, like a relay. After the exchange of musical sentiments, they play music together in harmony to complete the performance. Collaborations are not always successful, though. I call it an arranged marriage. At times, these randomly chosen musicians create an utterly breathtaking performance, while for some, they may have been better off not doing it at all [laughs]. 3) Impromptu performances where randomly selected artists come up on stage and showcase their talents. The prominent characteristic of such sessions is that the artists involved will perform together without any prior rehearsals. It is a program initiated by Canadian folk music festivals. Q. The audience tends to go wild when they witness one of those unexpectedly magical moments. How do these performances affect the festival? Kerry: Another advantage of the collaboration sessions is the discovery of artists from home and abroad who would otherwise not have been headliners. Generally speaking, it can sometimes be hard to attract audiences to performances by up-and-coming local artists or international world musicians. But with the collaborative sessions [which often pair new Canadian talent with foreign artists], audiences get to see unfamiliar instrumental mash-ups and the harmony between artists triggers something in them. It’s the same for the Geomungo Factory. Few Canadian audience members knew what the geomungo was, but a collaboration with a violinist like Iva Bittová or rapper Leonard Sumner, or jazz-punk musician Stephanie Nilles, helps people familiarize themselves with a new sound. These experiences not only inspire the listeners but the musicians as well, while also helping to promote the artists involved. Q. How did this idea come about? Is this the tradition of Canadian music festivals? Kerry: Yes. It probably started with the Mariposa Folk Festival. The collaborative sessions are mainly held at folk festivals in the western region, starting in Winnipeg and stretching west. This is an approach that hasn’t been seen at festivals of other genres, such as Canadian rock or world music. It is a very Canadian concept. Another very Canadian feature is that, at these festivals, all genres of music are mixed. Indie, bluegrass, punk, world music . 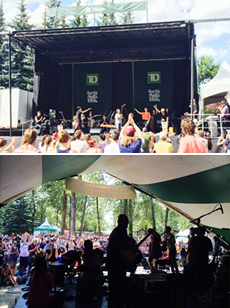 . . these performances [where such collaborations occur] are only seen in Canada’s western folk festivals. Gary Cristall, the then artistic director of the Vancouver Folk Festival, was the pioneer, and began to assemble lineups that included musicians from around the world. This inspired other directors to do the same thing, and it has since become a tradition. Q. How do you network with the foreign musicians when you invite them? I’d love to know how you get your connections. Kerry: When world music was first introduced to Canada, it was largely made up of African and Caribbean artists. African music was the starting point of the spread of world music, and Asian music—such as Indian music—has recently come on to the radar, and is gradually being embraced. The network of artistic directors among these festivals is a practical source of information. We met Geomungo Factory just before meeting with the personnel from WOMEX, at the recommendation of the artistic director of the Winnipeg Folk Music Festival, Chris Frayer, who had visited Korea. And we were put in touch with [Korean music group] Dulsori through a Canadian agency, if I’m not mistaken, but the determining factor was the fact that the artistic director of the Vancouver festival liked the group. Festival directors share this sort of information with their colleagues. The Canada Council for the Arts has a fund to support musicians from Canada and abroad for their tours, so sometimes they find artists suitable for the festivals and suggest that we invite them. There are times when the artists’ home country supports the cost of flights, which makes inviting them much easier; covering the costs of international flights for all of the performers would be difficult, obviously. This is especially true for artists from remote areas. Q. 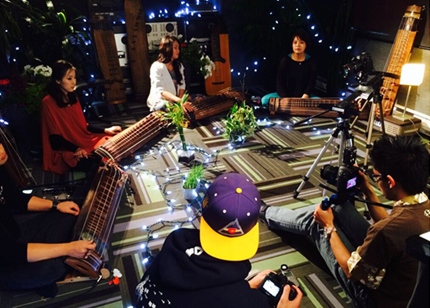 Both Geomungo Factory and Dulsori performed at the Calgary Folk Fest in 2014. I understand that they were the first Korean group to perform. How did the local audience respond? Kerry: That’s right, they were our first Korean group. People reacted positively to the collaboration session—the audience is typically very open to new or foreign music. They have fewer opportunities to encounter Asian music, so the anticipation for these performances builds up. For Geomungo Factory, we had some concerns because they perform sitting on the floor and that is definitely not something you see often here. The large number of performers means we have to limit the amount of set-up time to 15 minutes, and I didn’t know if this group would be flexible enough for such a quick transition. For the collaborations, we came up with the idea to group them with other string instruments and with other Asian groups, though we were nervous because we didn’t know if Asian music would go well with music from other parts of the world. But in the end, everything was fine. Q: I would love to hear a bit more about you personally. How did you find yourself in your current role? Kerry: I worked as a programmer at the CJSW Campus Radio Station, where I grew fond of noncommercial music from being exposed to various genres. It was around that time that I saw a job opening for the role of artistic director for the Calgary Music Festival, and now I’m here. It’s been 20 years. Q: You must be really attached to this job. 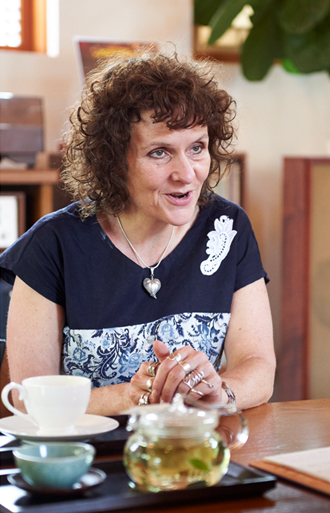 What are your future plans as artistic director, and as Kerry? Kerry: In February, we are planning an indoor festival with 25 musicians performing on three stages. Making this event a success has been the major topic of discussion.Maintaining what we have now would be the main concern for the Calgary Folk Fest. Our recent focus has been operating the existing festivals more smoothly by putting an emphasis on the environment and issues related to safety, and trying different levels of alcohol restriction. The scale of the festival has expanded significantly over the last two decades. From the main evening performances to the performers between sets and the after-parties, 120 performances are held on 11 stages over four days. Rather than increasing the number of stages or making overly ambitious plans, I want to concentrate on what kind of musicians will perform or which country will be in the spotlight—adhering to the original framework while enhancing the level of completion. Contributor Lee Su-jin was a former international exchange producer, responsible for managing the overseas tours of Geomungo Factory and the Cheong Bae Traditional Art Troupe. She currently works with the Gyeongnam Foundation for Art Culture in Changwon, Gyeongnam-do, promoting international exchange and networking involving local musicians.